A few weeks ago, I was contacted by JoAnn Fabrics and Crafts to share a simple craft as part of their Creativity Made Simple mission. In return they would offer me a gift certificate to purchase the supplies and also a coupon for the readers of Call Ajaire. It sounded like fun to me so I happily agreed. However, there was a catch….. They asked for a VIDEO of me making the craft. I am not someone who is fond of being in front of a video camera, so I cannot believe I agreed to do it, hehe. But I do spend a lot of time at JoAnn’s and the idea of pairing up with them to make a craft did sound fun. 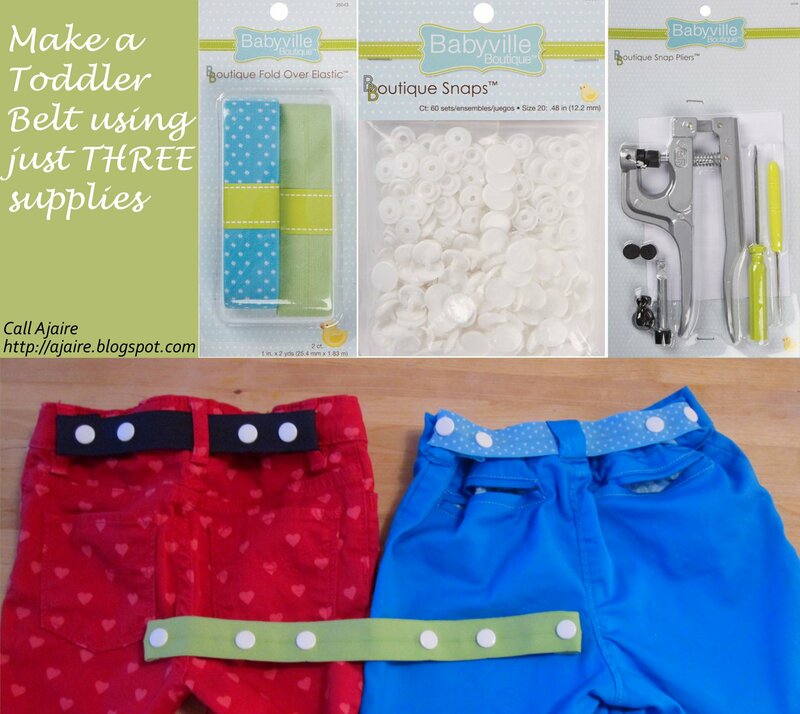 The project that made the most sense to share in under four minutes was a simple toddler belt. I’ve been eyeing the Babyville snap pliers for a while and this was the perfect excuse to make them mine, hehe. I don’t know why I’m so in love with those plastic colorful snaps, but I am. Maybe it’s because they use them on cloth diapers these days so I see them all.the.time. Since the project uses only three supplies it was the perfect craft to go along with Creativity Made Simple. Apparently, the team at JoAnn’s thought it was a great craft because they have added it to their YouTube page! There are 15 other crafts up there from various other bloggers (you’ll recognize some of them!) too, so go and check them all out. One more thing before I give you the video link: JoAnn’s is giving away a $100 gift card to one of my readers and one to me IF the Simple Toddler Belt video is the most watched of the group so feel free to share the link! The video with the most views will be announced on April 26th, and if by chance we win, then I’ll randomly choose the gift card winner from one of the comments on this post. So make sure there’s an email address or a way to contact you if you comment! For those who are wondering, the pink heart skinny jeans are from the Gap and the blue shorts were made by me from Blank Slate Patterns’ Clean Slate Pants (affiliate link). 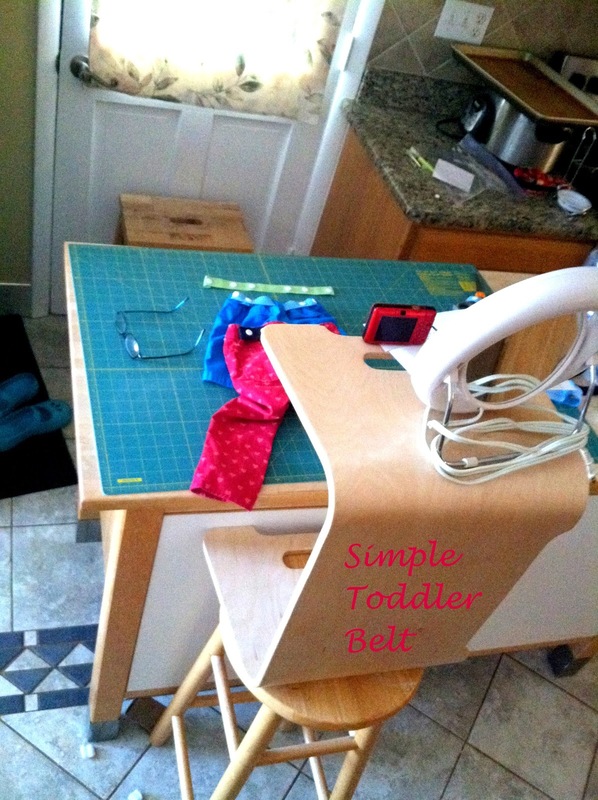 I just added three belt loops to the back to hold the toddler belt. Since I don’t take many videos and definitely none of myself, I couldn’t even find our tripod to set up the video camera (which is just my regular camera that also takes video, hehe). So I had to improvise. It’s a wonder that the video even came together. I made the whole thing during one of Bean’s naps and it was a seriously laughable scene. This is what our kitchen looked like. Sorry about the iPhone picture, but as you can see, my regular camera was perched up on Bean’s desk being used as a video camera at the time, hehe. Oh and I also have that coupon for JoAnn Fabrics that you can use through March 31st. Either print out the coupon image below to bring to the store or use the coupon code adhr090 online in your cart at checkout. In return for making the video, JoAnn Fabrics and Crafts Stores gave me a $25 gift certificate. If Call Ajaire’s video is the most watched of the 16 Creativity Made Simple craft videos, then JoAnn Fabrics and Crafts Stores has said that they will give a $100 gift card to myself and one of the readers of Call Ajaire. All opinions herein are mine. I also should mention that I have recently added an affiliate link for Blank Slate Patterns on my sidebar as well as in some of the links in this post, but I sewed using their patterns long before even considering it. These are just great patterns that I truly stand by and I am excited about being an affiliate. Cool video! You did great, don't worry! OK, I can't stand it- what is that white thing your camera is sitting on? It looks like a meat slicer. I clicked on this because my boys pants keep falling down! They have tiny waists and even though I don;t sew much – a belt would really help them. Thanks for sharing this. This may be obvious to most but I have to ask: why 2 sets of snaps? Is the extra set receiving ends as well? Thanks for the video, it's great to see these gadgets in action. Love this! My son's pants are always too wide or too short, and I hate to be limited to the adjustable-waist options. Also, I just happen to have all the supplies here 🙂 Making one of these right now! You did a wonderful work with Joann fabrics…Great!! what do you think is the age range of this belt? does it fit well for children 1 year – 6 years?